Theater Breaking Through Barriers, a company which uses artists with disabilities and able-bodied performers in their productions, and who presented a winning collection of one-acts last year with Sum Of Our Parts, had another success this past June with More Of Our Parts, billed as "six new plays (all world premieres) about disability in 70 minutes", at Theatre Row Studios with topics ranging from the funny to the satirical to the very touching. Starting things off was The Ahhh Factor by Bruce Graham. With a script that had the feel of a work by David Mamet, the play features a meeting between Robert (Warren Kelley), a director, and Jerry (Jonathan Todd Ross), a writer, regarding Jerry's film script and how a deaf character, to be played by a deaf actress, should be presented on screen. Robert, not quite comfortable with the whole idea, goes way over the line in political correctness so as to not offend anybody, while Jerry urges the character be treated just like any another person. A satire on liberal guilt, the author shows what can happen when one tries to overcompensate for something you don't want to deal with and letting your own fears and prejudices cloud the issue. Nicely written, and well directed by Russell Treyz, the play really hits home thanks to some hilarious lines uttered in perfect deadpan earnest by Kelley. Definitely the most poignant piece of the group was Jeffrey Sweet's A Little Family Time. Eli (Shawn Elliott), a respected sixty-something writer, is unable to deal with the fact he has a mentally disabled son named Lewis (Joshua Eber), even concealing it from Annette (Donna Bullock), the woman he intends to marry. When Lewis appears unannounced and uninvited at speech Eli is about to give, the two make small talk, Eli desperately trying to ignore the elephant in the room, one growing ever larger as the conversation progresses - something quite apparent to both Annette and Nell (Blair Wing), Lewis' companion at the assisted living center where they both stay. Great credit must go to Elliott in making Eli come off as a completely three-dimensional person and not just a simple caricature. A heart-wrenching story about denial in the face of truth, the moment when Lewis embraces his father and Eli can't bring himself to respond is shattering. The play is directed with strong respect for the subject matter by Patricia Birch. After Breakfast, Maybe by Bekah Brunstetter presents an interesting look at a somewhat strained mother and daughter relationship. 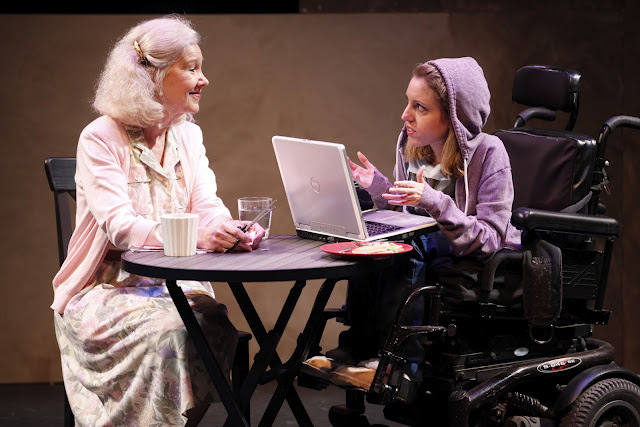 As the play begins, Marcy (Shannon DeVido) who's unemployed and living with her mother, is planning to take over the world via the internet, while her mom, the almost computer illiterate and somewhat overprotective Diane (Melanie Boland), questions exactly what her daughter is doing and why she is attempting it. Yes Marcy realizes this idea is all a fantasy, but it's her fantasy and she's determined to carry it through, using her mind and imagination to do what her body cannot. While Marcy continues plotting her elaborate scheme and Diane continually interrupts with various mundane comments, such as the fact she's made pancakes with smiling faces for breakfast, the play presents a scenario of a seeming inability or unwillingness to learn new things and move forward from one's present position, due to an overriding fear of failure and looking stupid - a fear that does far more damage than any actual limitation. While a bit clichéd at times and ending just a bit too abruptly, the piece takes the characters from a forced co-existence to one with perhaps just a bit of hope for the future. Playwright Neil LaBute's penchant of looking at the dark side of human nature is evident once again with his work The Wager, where a Guy (Nicholas Viselli) and Gal (Tiffan Borelli), an upscale white couple, are leaving a party when they're accosted by a Homeless Dude (Shawn Randall) a wheelchair bound black man, who asks them for change. Guy, who's not a nice fellow to begin with, quickly begins belittling the Homeless Dude unmercifully, claiming the Dude should get a job and find ways to earn money instead of begging for it, all the while ignoring Gal's pleas that the two just leave. As Guy continues to push things further and further, and the situation becomes more and more explosive, it seems violence and disaster will surely result. However, there is a twist here, more than one actually, none of which the audience sees coming, whereby motives and assumptions turn out to be not at all what they seem. An involving story about perceptions, the most interesting moment of the play occurs when the Homeless Dude asks Guy to join him for a drink; an offer Guy hurriedly dismisses out of hand, the Dude's usefulness to him being over. A.R. Gurney's The Interview takes place during a car ride where Ken (Stephen Drabicki) a deaf teenager, is telling his father Howard (Nicholas Viselli) about his interview for acceptance at a prestigious college. The meeting may not have gone as well as hoped since Ken didn't reveal his condition to the interviewer, Ken not wanting to be accepted at the college, or in life, solely because he is deaf. However Howard urges that since being deaf is a part of who his son is, he should not hide that fact and if need be, sometimes actually use that condition to show just how special he is. As with many of the plays in this collection, all of which deal with opposite points of view with the truth being somewhere in between, Gurney provides a gentle lesson on how honesty will only get you so far, and that it's one's abilities that get you the rest of the way. Like the LaBute play before it, the circumstances are more involving than the characters involved, but all in all, it's an interesting morality tale. Last up is Samuel D. Hunter's Geese, an amusing, if somewhat pedestrian piece about the difference between people's public and private personas. Ben (David Marcus), is a city worker who has to remove geese from a park and take them away to be killed, they being a danger to airplanes. However Ben may not have the heart to do so, especially when he meets Melanie (Shannon DeVido), a woman in a wheelchair who claims to love the birds, even though she's eating chicken salad for lunch. This piece takes a look at the question of perception, as well as how much power a person in a wheelchair can have sympathy-wise, and how people can unconsciously overcompensate when talking to such a person. Stronger than the script itself are the various acting performances, which ultimately show Geese to be the most politically incorrect play of the bunch. Especially enjoyable were the reactions of a pair of joggers (Melanie Boland, Tiffan Borelli) who happen to wander into an argument Ben and Melanie are having. 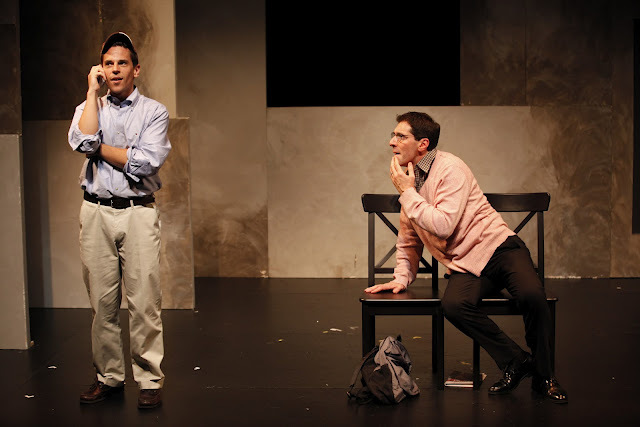 The play also stars Shawn Randall and Jonathan Todd Ross. It's a testament to the various writers, directors and performers that each work was able to pretty much grab the audience almost immediately and hold their attention throughout. Additionally, the premises from many of these pieces could easily be expanded significantly were the playwrights so desirous. As with any collection such as this, some of the shows worked better than others, with The Ahhh Factor, A Little Family Time and The Wager being the most interesting, but all were enjoyable to varying degrees. Best of all was the seamless way the different performers interacted with each other, treating their conditions and situations as part of the story when needed, and ignoring it when not.